Dalan is a shapeshifter. He hails from a tribe of mutants dedicated to preserving fading species by taking their forms. To become fully recognized as an adult, he must pass a trial in the wastelands far from home. Nyr is a killer. When her lust for bounty yields an ancient artifact of mysterious origin, everything she knows is turned upside down. Once a hunter, now a pawn, she must learn to rely on others to survive what’s coming. Korreth is a slave. Without any extra talents, he depends on nothing more than his strength and wits as he flees the army of mutants that enslaved him. He must return home to warn his people before the swelling ranks of monsters threaten his family. …but in the shadows, a new threat rises–one that could end what little remains of civilization: The Last of the Ageless. 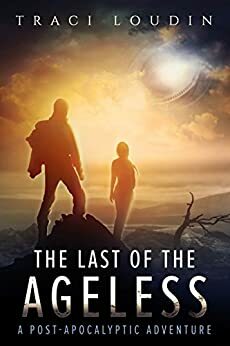 The Last of the Ageless is inspired by lots of other science fiction books I read, particularly as a teenager. It’s very clearly inspired by my love of the Animorphs series as a child. My favorite post-apocalyptic novel is Andre Norton’s 2250 A.D. or Star Man’s Son, in which the main character is a mutant adventurer with an animal companion, much as Dalan in this novel does. Another major inspiration for it are all the adventure novels by Edgar Rice Burroughs, including the John Carter of Mars, Pellucidar, and Tarzan series. Tarzan is the first real superhero, and I hope that my adventures live up to those. Dalan and Nyr have been in my head for a very long time, so I’m not actually sure where they came from. Korreth and Jorrim started as two very similar slaves, but as I began writing, the story shaped their personalities and showed me how different they were. I know some authors say that their characters’ voices are very clear in their heads from the beginning, but Korreth and Jorrim were not in mine. Their voices crystallized over time through multiple drafts, and as I gained mastery over their voices, I rewrote their dialogue with that in mind. I also get sick of reading romance disguised as science fiction and fantasy, so I wanted all my characters to be the types of people who, when faced with extraordinary circumstances, are more interested in getting out alive than in stopping the plot for random romance. From the corner of his eye, he noticed the twitch of Saquey’s wings, but it remained on the rock. The fire’s heat plastered his pants against his legs, and he took a step back. He hoped his bait would draw her thoughts away. “The second reason for killing?” Dalan resisted a victorious smile. “Vengeance for life taken.” But his mirth faded. Vengeance had led him to his first kill, a memory he tried not to think about. “That makes no sense.” Nyr scuffed up sand and collected it in a cup. “Why not?” Dalan picked up his pack and slung it over his shoulder.